Good time Rocking West Coast Country at its finest. My lack of a Degree in American Music History has let me down again, because I had no idea who Shawn Mullins was until I began researching him for this album review. He has been nominated for a Grammy and had a Platinum selling album yet I’d never heard of him even though this is his 16th album in 20 years! The ‘driving song’ California, kick-starts LIGHT YOU UP with a tale about getting stuck in traffic in an El Camino; with “Dylan’s Bootleg Sessions on the stereo’ and a host of other references that will make you believe that you are sitting in the backseat. Title track Light You Up, with its infectious reggae beat is, on one level a simple love song but by continuous listening it’s a cool insight into the life of a Star because ‘everyone wants a ‘puff of your pipedream/everybody wants a lick of your ice-cream’. My own favourite and what will become yours too is Phil Madeira’s mean and moody The Ghost of Johnny Cash which packs more punches than Amir Kahn. The obligatory love song I Knew a Girl wanders along blissfully with a sweeping and soaring string section (in a modern Buddy Holly style) until Shawn finally drops the most amazing heartbreaking bombshell at the end; leaving the listener misty eyed and snivelling. Catoosa County could easily have fallen into a syrupy Bluegrass trap but Shawn Mullins makes this Civil War tale race along like a Hemmingway novel and it’s well worth a listen. The album finishes with a another delightful love song – Love Will Find a Way, whose title tells you all you need to know and I’ll repeat myself….it is delightful! 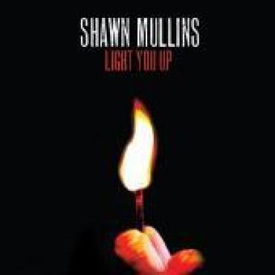 Shawn Mullins is the essence of West Coast Soft-Rock from the 80’s but manages to sound cutting edge and perfect for the beginning of a new decade. LIGHT YOU UP is the best album that the Eagles never made!